Tricia Ross is a full-time journalist who studied English at the University of California-Los Angeles. She has run a marathon and three half-marathons and has training in sports massage therapy. Ski goggles are invaluable when you're out in the snow, protecting your eyes from the wind, debris and sun glare. But fogging is a common problem and can become a hazard while you're skiing. Since fogging is a result of hot air and cold air coming together, reduce the contrast in temperatures between the outside air and your face to keep your goggles clear. Don't overdress. 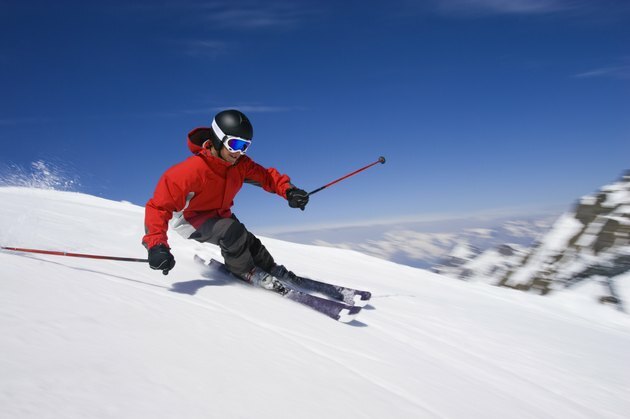 Adding too many layers may cause your body to overheat while you're skiing. The warmer your face is, the more likely your goggles will collect condensation since the temperature difference between the outside air and your skin will be greater. Wear just enough clothing that you're warm but not breaking a sweat as you ski. Put on your goggles before you go outside. This will bring the goggles to the same temperature as your body, thus preventing fogging. Once they're on, don't take your goggles off until you're finished skiing. Removing them will allow them to cool, creating a contrast against your warm face and causing fogging. Keep the air vents on your goggles free. Avoid wearing gaiters, which funnel warm air from your body up beneath the goggles. Periodically check the top of your goggles to clear off any snow that may have accumulated and may be blocking the top vents. Air flow keeps fog at bay. Use anti-fogging cleaners and wipes as necessary if your glasses aren't pretreated. Don't use glass cleaner to clean your goggles. They can remove the anti-fogging protection on the lenses. Instead, rinse your goggles with plain water. If your goggles come off during skiing, don't wipe them clean. Let them dry upside down to avoid disturbing the anti-fog treatment on the lenses.